Suppose your name is Woody and you want to promote your chainsaw dealership via the Internet. You build a website that announces the products and services of Chainsaw Solutions to the world. You design the site with the latest software tools and host it with the most powerful servers available. You work very hard and put a lot of time into this project. During the process, you learn a lot about how websites work. Your employees notice that the job title on your business card now reads “Chief Web Developer” instead of “President.” You fancy yourself a technology artist. So proud are you of the new site that you offer the first ten visitors a free chainsaw valued at $1000. Such a site would receive thousands of hits from the timber cutting community, right? You check the statistics a week after publishing the site and learn, to your disappointment, that it received a mere one hit! Only your mother-in-law who cut and pasted the link into her AOL browser managed to traverse your work of art. She now demands that you not only deliver her free chainsaw, but that you use it to clear a nasty grove of redwoods from her back yard. Family politics aside, you shouldn’t take it personally that no one came to the Internet grand opening of Chainsaw Solutions, should you? Nah. Successful web artists only pity the competition. Besides, those missing visitors were probably just not aware that the greatest chainsaw dealership in the world made its web debut. But, how are people going to find your website without you actually giving them the address? Doesn’t the Internet do that automatically? You brew some coffee and perform a Yahoo search using the words “web“ and “promote” and “increase traffic.” After a bit of reading you learn that you can promote your site to various search engines and that you can optimize the ranking by using something called “meta tags.” You read further. As best you can determine, meta tags announce the topic of your pages, describe their content, and provide other information useful for search engines in cataloguing pages. So, if your pages contain meta tags that accurately describe the site to your targeted audience, you’re going to get hits from potential customers. In other words, visitors who search Looksmart.com for Chainsaw Solutions should return results that yield a link to the page and an accurate description of what they will find there. Click! As you research meta tags a bit further, you learn that they are actually part of the html code inside an html page. That’s a negative because the newly discovered right side of your brain shuns mathematics. Besides, you have been warned by your programmer friends of the mysterious missing time phenomenon that prevents coders from accounting for hours, even days of time. But you’ve come too far to let html stand in the way of your technology renaissance. Knowing html will help you create meta tags, but it’s not necessary. After reviewing meta tags on other websites, you surmise that they tend to occur in two forms: the META NAME and the HTTP-EQUIV varieties. The first tag below tells search engine spiders to come back after two weeks. The second tag tells spiders when the page’s content expires so it knows when to revisit. Spiders are agents that gather content for search engine databases. Besides the words META NAME and HTTP-EQUIV, both tags are exactly alike in syntax. The only other difference is what’s inside the quotation marks. The first item in quotes describes what the tag does, the second item in quotes is the variable or the part that you change to affect search engine placement. All meta tags should be placed between the <HEAD> and </HEAD> tags in your html source. The opening <HEAD> tag usually comes at the beginning of the source code after the opening <HTML> tag (normally the very first tag that appears). The more you research meta tags, the more tag types you discover, each with its own good intentions. After sifting through over a hundred or so, choosing the right tags for your website becomes a confusing task. Even the tag names themselves can be daunting to the non-programmer. There are actually tags called “Abstract” and “Pragma.” However, three particular tags seem more common than the others: Title, Keywords, and Description. The title text is not viewable by your visitors in the page itself, but shows up in the Windows taskbar and in a browser’s favorites or bookmarks. If you include a description in your title, it should not be longer than about five words or else the browser’s favorites will truncate the title when bookmarked. Notice that the Title tag is a standard html tag and does not include META NAME and HTTP-EQUIV nor quotation marks. A few months go by after your meta tag coup. The ten chainsaws from the free giveaway have been shipped. Your traffic has increased greatly. Your mother-in-law’s redwoods have been cleared. You have received numerous orders via the Internet. However, you notice that you are suddenly getting a hefty amount of spam in your inbox. Not that you don’t already shovel your share of spam, but something seems different. This spam is not from the usual spammers, but from some unfamiliar sources, including some invitations of a particularly deviant sort. There is much more to meta tag lore than discussed here. In the above adventure, Woody looks at the trees, not the forest. Each search engine employs different methods of gathering data for indexing. Meta tags are not a guarantee of high placement, but may help rankings with some search engines, especially when using the big three. Many programs and free online meta tag generator tools make it easy to create meta tags without even looking at the html source. One such program is Clickfire’s own freeware meta tag maker, Metty. After publishing your web pages, keep your eye on the way search engines are displaying and ranking them. Experiment with meta tags. You may learn something and you may discover yourself to be an artist. Do I have to put Meta Tags on each Page? @ BC – Search engines have come a long way since the days of meta tags. It’s not necessary to put meta tags on all (or any) of your pages to improve search engine rankings. Meta tags were used a great deal in the early days of search engines, but now, search engine algorithms are more sophisticated in determining which sites should rank high. Now, Google, Yahoo and other search engines place more weight on criteria like on page text and inbound links. Search engines no longer have to rely on hidden tags inserted in HTML pages to determine what pages are about and what their importance should to searchers. Many SEO’s like myself still habitually include meta tags on each page (it’s hard to stop once you’ve started). It’s a good habit but don’t expect a great rankings boost. How often do I have to submit search engines? @ BC – These days, you only want to submit your site to the search engines once. Actually, you don’t even have to do that because search engines like Google, Yahoo, and MSN Live will find your site if other sites link to it. Their crawlers will meander around the Internet following links until they eventually discover your site. Once they do, your site doesn’t disappear from the indexes, but stays at least as long as links from elsewhere are pointing to your site. I’m always amazed to see search engine marketing firms that charge customers a fee for monthly submissions, as if Google would forget they indexed a site. 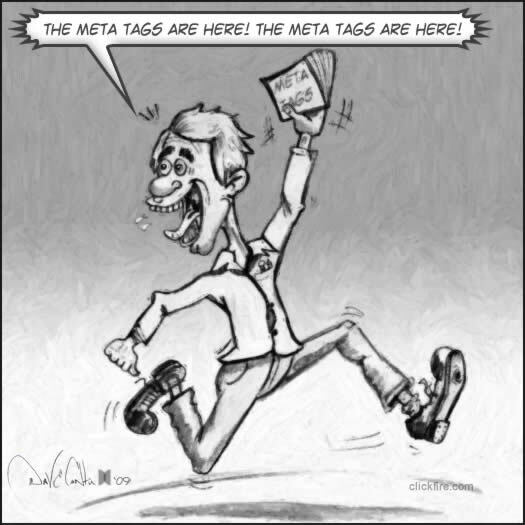 During web search i found this site and this valuable article about meta tagging. this is such a nice piece of writing. thank you. I found this today and it has helped me raise my ranking amongst other bed and breakfasts in the area. Luckily I m only competing against 4 others locally. thank you. very funny article. loved the sarcasm.